Xchat has the most features, why a 7, I’d give it an 8 or even 9. You say most features, but give Linkinus more? what the smeg? Linkinus can’t DCC(direct chat) for example. That means that if someone wants to talk with my Bot(scripting), it’s not possible. Had that problem 2 days ago. Features Colloquy 5, i agree. 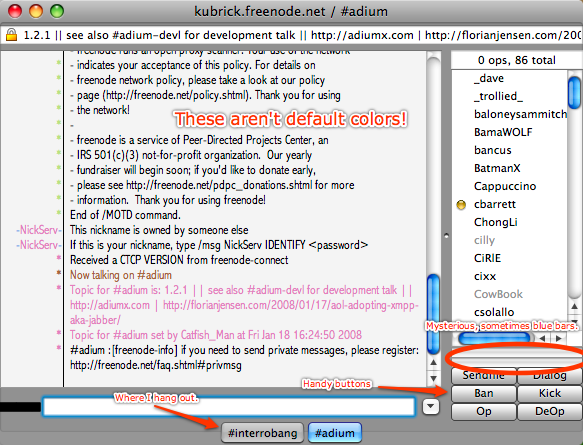 Okay, XChat is really ugly, Linkinus is eyecandy and colloquy is handy, but at what price. This is not a good review, because you’re not objective. Linkinus 15/20 because lack of features(but less than Collo) and you have to pay! 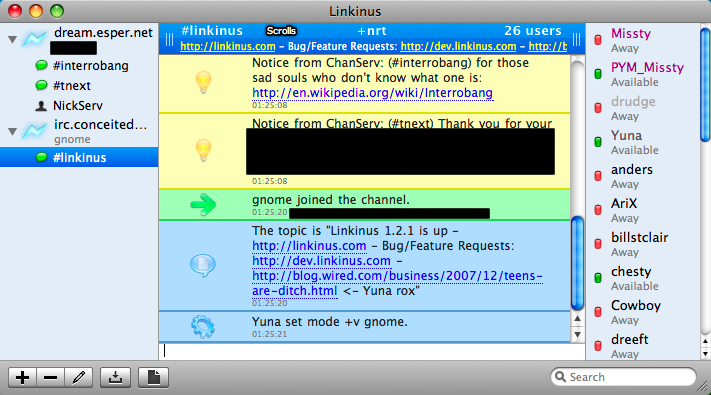 If Linkinus was free and opensource as it should be, I would give it a 16/20 because ppl could make new features and make it the best IRC on earth. Why just these three? None of them (And I have used all three for at at least a few days has made me as happy as Snak has. None have the full features of Snak, none have the complete GUI changeability as Snak. Iit’s scripting support (Which supports both Applescript, AND ircii scripts) plus your own simple aliases or actions. Snak has been around since 1996, is 10x more mature than any of the apps above. 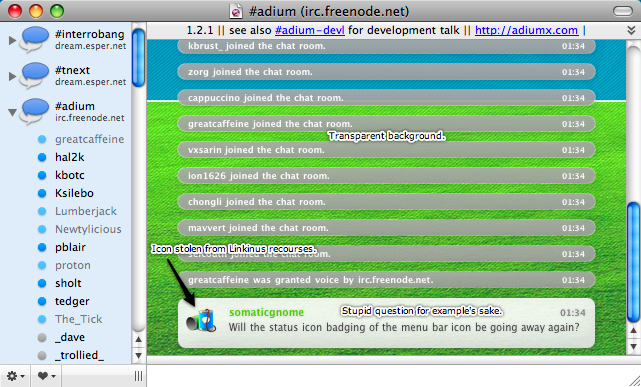 It reminds me of XChat Aqua, but polished and not dodgy. I REALLY wanted to like Colloquy, but it’s lack of support and customization and NO action or alias support turned me completely off. Not to mention some of it’s own preferences don’t work right. It’s almost as if they just tested the application on freenode’s servers. Linkinus is a GUI mess, and it wont let you change it in any major way to fix it. (I care less about text themes… ) and it’s buggy and hurts my eyes. Again a GUI shouldn’t DISTRACT the user from the content. It should just be a wrapper. Of them all *I* would choose Xchat Aqua. Why the two most used IRC clients for the Mac (Snak, Ircle) wasn’t in this test has me flabbergasted. Rifton mentioned irssi. I think it’s *THE* most powerful client, not only on OS X, but also Linux distros and even Windows. If you’re willing to learn it, and not give much of a crap as to what it looks like (irssi runs in the terminal), I think you’d be impressed. It’s lightweight, can be run in the background (screen) and is just powerful as all hell… I think irssi could take on any of the clients you reviewed.